Featuring the basic principles of materials selection for application in various engineering outcomes, the contents of this text follow those of the common first-level introductory course in materials science and engineering. 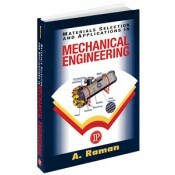 Directed toward mechanical engineering, it introduces the materials commonly used in this branch, along with an exhaustive description of their properties that decide their functional characteristics and selection for use, typical problems encountered during application due to improper processing or handling of materials, non-destructive test procedures used in maintenance to detect and correct problems, and much more. What’s more, numerous examples and project-type analyses to select proper materials for application are provided. With the use of this unique text, teaching a relevant second-level course in materials to ME majors has never been easier! • Covers all aspects of engineering materials necessary for their successful utilization in mechanical components and systems. • Defines a procedure to evaluate the materials’ performance efficiency in engineering applications and illustrates it with a number of examples. • Includes sample project activities, along with a number of assignments for self exercise. • Keeps chapters short and targeted toward specific topics for easy assimilation. • Contains several unique chapters, including microprocessing, MEMS, problems encountered during use of materials in mechanical components, and NDT procedures used to detect common defects such as cracks, porosity and gas pockets, internal residual stresses, etc. • Features commonly used formulae in mechanical system components in an appendix. • Several tables containing material properties are included throughout the book.